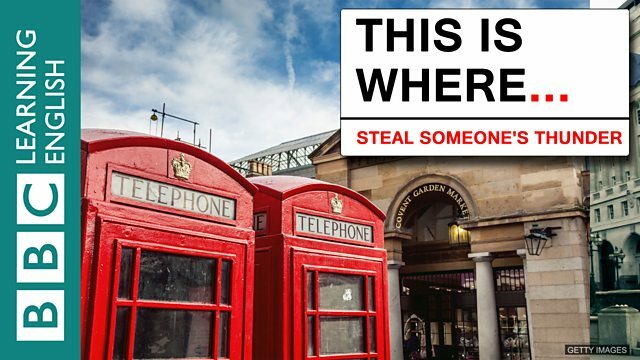 Our second series, This is Where… takes us on a tour of London to discover the origins of unusual English phrases. In English, to steal someone's thunder means to take the attention away from someone else, when they were expecting to get all the credit. Lots of people in the UK know what this phrase means, but not many people know where it comes from – as presenter Rav Wilding found out when he went to talk to some Londoners on the street. I did the splits on the dance floor, but Elsie stole my thunder by doing a backflip! Izzy made a great joke, but a dog ran on stage and totally stole her thunder. In the UK, if you said that someone had stolen your thunder, most people would know what you meant. It means that someone's taken credit for something that you've done. I guess, they did something better than you did, and they took all the credit for it. Can you give me a sentence where you would use that saying? I should have been promoted but someone else stole my thunder. I was going to make a unique presentation at work, and somebody had stolen my thunder. If someone turned up to my wedding in a great big white dress, they've stolen my thunder. But not a lot of people know where it comes from. Where do you think that saying came from? I've not a clue. Maybe the British weather! I don't know. Maybe the weather?! What these Londoners don't realise is that stolen your thunder came from here. The Theatre Royal in Drury Lane is the oldest theatre in London's West End. It's even older than the BBC. In 1709, a man named John Dennis invented a machine that made a noise just like a clap of thunder. The thunder machine was fantastic, but Dennis's play wasn't. Soon after its opening night, his play was replaced by a production of Macbeth. When John Dennis went back to the Theatre Royal to see this new production he was outraged to discover that his thunder machine was being used in Macbeth, and no one had asked his permission. The story goes that he stood up and shouted “they will not let my play run, but they steal my thunder.” And so the phrase to steal someone's thunder was born. And it came from the area around here, and not from up here. The Theatre Royal in Drury Lane is the oldest theatre in London’s West End. In 1709, a man named John Dennis invented a machine that sounded just like a clap of thunder. The thunder machine was fantastic, but Dennis’s play wasn’t. Soon after its opening night, his play was replaced by a production of Macbeth. When John Dennis went back to the Theatre Royal to see this new production he was outraged to discover that his thunder machine was being used in Macbeth, without his permission. The story goes that he stood up and shouted “they will not let my play run, but they steal my thunder.” And so the phrase to steal someone’s thunder was born. If you are unsure, check the text in the page above or watch the video again. Why was John Dennis unhappy? Which one of these is has the correct use of the phrase ‘steal someone’s thunder’? Join us in Session 9 of The Experiment where we discover the origins of another London-born phrase.